Greetings again from the darkness. With release dates so close together, this documentary from director Christopher Martin makes a superb companion piece to director Matthew Heineman’s film, A PRIVATE WAR – the Marie Colvin biopic with an excellent performance by Rosamund Pike. 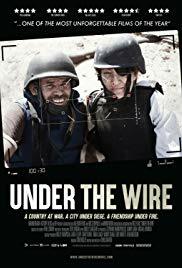 Heineman’s film really helps us understand what drove Ms. Colvin to become the most courageous and well-known war correspondent of her time, while Martin’s doc provides an incredibly up-close look at the dangerous environment that inspired her reports. In February 2012, Ms. Colvin and photographer Paul Conroy were smuggled into Syria (journalists were prohibited at the time) and found their way to Baba Amr, an area of Homs, Syria. What they discovered was horrific. What the Assad regime was doing to its own people, its own children, was not what Marie and Paul had known as war. Instead they described it as slaughter. They were determined that “the world must see”, and for the next few days, they discovered “The Widows Basement” where women and children were trapped. They watched a relentless Dr. Mohamed desperately try to stitch the injured back together in a makeshift clinic with minimal supplies. The film is based on the book of the same title by Paul Conroy. On the day the bombing killed Marie and French photographer Remi Ochlik, and many other civilians, it was Paul and French correspondent Edith Bouvier who survived, despite serious injuries. Mr. Conroy acts as our commentator as much of the footage he shots plays on screen. He admits to carrying the weight and responsibility of telling not just Marie’s story, but also the truth about what they witnessed … it’s a brutal war that continues today. Some reenactments are blended with Conroy’s footage, and we fully understand the terror they felt in entering the drain pipe that acted as the artery to Baba Amr. The infamous clip of the dying baby shown on Anderson Cooper’s CNN interview with Ms. Colvin is no less devastating now. Paul admits that some described Marie as “scarier than the war we are covering”, but no one doubted her courage and drive to tell the stories of those who were being forgotten. As the Sunday Times war correspondent recognizable by her eye patch, Marie’s work with Paul is the best defense possible for our need for truthful and full journalistic coverage … it should be our protection against forces motivated to mislead or misdirect. Paul’s commentary of his extraction from Syria reinforces what courage is required not just to rush to the story, but also to find a way to tell it. This entry was posted on Thursday, November 15th, 2018 at 11:23 pm and is filed under Documentary. You can follow any responses to this entry through the RSS 2.0 feed. You can leave a response, or trackback from your own site.